As I mention on my previous post “Big ,Loud, Crowded, Nepali wedding”, I know my husband, AS since high school. But our story is nothing like childhood sweethearts with happy ending. We were just friends at that point and never in my wildest dream thought will we end up marring each other. It is so true when they say, “You don’t know what future holds for you”. I was ready to take next step of my life – marriage and family. The only problem with my plan is I have no plan. I didn’t know what I really want. I have never thought in my whole life I will agree with arrange marriage. But as I can’t find the man of my dream, I thought, I will hand over the duty to my parents. As my parents always nag me about marriage, I thought this will make them busy and I always can say no. They were more than willing to take the charge and was so proud that despite living abroad for almost a decade, I choose to go traditional way. AS is not a very social person so we used to be out of touch for ages. Our email frequency used to once every 6 months. But thanks to Facebook, which I was genuinely surprised he had one, we start talking again. Our infrequent message turned into more frequent one and it was like high school all over again. We had same memories, same friends and it was easy. During this period, I told him one day what I told my parents about looking for a guy for me. To this he said that his parents are looking for a girl for him as well. And then we used to joke about how life has turned out and may be we will meet again only when both of us will be married and have kids. He used to be in US at that time and I was in Australia. That year I decided to go home for holiday and I had 12 hours transit in Singapore airport. I told him, if he had any time I will appreciate the company over net as I don’t know what else to do in Singapore in the middle of the night. As the time difference was right for him, we chatted for almost 10 hours out of 12. (He told me later he made a special effort that stage.) I think that probably was the first time I felt more close to him. We made fun of each other and asked silly questions and it was great. I wasn’t bored at all and hoped he enjoyed it too. During this conversation, he told me he is planning to come to Nepal as well and try to make it when I will be there. I was really happy thinking at least we can meet again. We didn’t meet until next 3 weeks but lots of things changed during that period. We used to Skype a lot and talked about my “Possible husband “. It was not that they were bad but I was not ready to meet anyone new so I just made any excuse not to meet them. And numbers of photo was increasing as my parents were determined to find someone before I leave Nepal. I think my frequent mention of these eligible bachelor made AS realise that the plan he had to express his love for me after he sees me Nepal can’t wait till then. He has to do something otherwise I may be engaged before he knows it. So while we were talking on phone one day, late at night for me and early morning for him, he expressed his feeling for me. He told me how he was in love with me since our school and I am his first love who he never forgot. I was surprised that I never saw that vibe from him ever but I was happy at the same time. During last few months I felt closer to him but I was so sure he will never fall for someone like me; I even try to set him up with one of my good friend. She will kill me if she finds out now. Anyway that was how we started our journey for our happily ever after :). And after all I am not the “Arrange Marriage Type”. 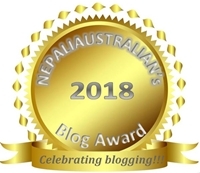 This entry was posted in Australia, Kathmandu, Marriage, Nepal, Our Wedding, Wedding and tagged arrange marriage, big nepali wedding, family, love, love marriage, marriage, Nepalese girl, Nepaliaustralian, relationship, US. Bookmark the permalink. Its amazing how most of today’s love stories have to give credit to msn, skype, and aim. My follows along the same lines. Msn chatting for hours and hours until you forget what day it is, and what time it is. Hehe. This post made me smile and also fondly remember when my Simba and were “just friends” but chatting on aim for 5, 6, or 7 hours at a time. We never ran out of things to talk about and that’s kind of where I fell for him and realized how interesting he was and how I couldn’t care less what other friends were online as long as I saw his screename pop up 🙂 Enjoyed this post though and glad it worked out for both of you.